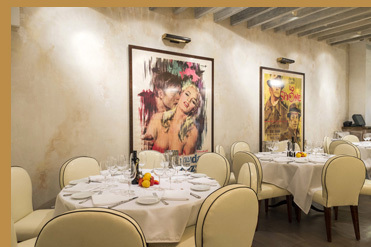 We had an excellent dinner at MAMO restaurant, a stylish and attractive restaurant located in the SOHO neighborhood of New York City that features a sophisticated blend of Italian and Provençal cuisine lead by the talented Michelin-starred Executive Chef Massimo Sola. 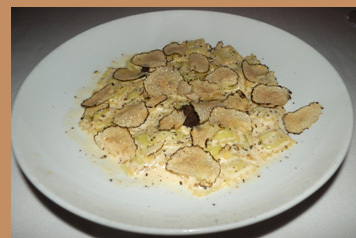 Truffle fans will appreciate their signature dishes, and there is much to appeal to diverse palates. Bravo! MAMO restaurant has two levels of dining, a smaller and more intimate first floor Lounge is open for dining on Friday and Saturday nights, and a larger dining room on the second floor accessed by a flight of stairs graced with a collection of mirrors along the wall to catch the eye. We dined at the restaurant on a Sunday night in early April, and had dinner on the second floor where large vintage movie posters graced one wall, an exposed brick wall featured rectangular mirrors, and the long marble bar anchored by large vases of fresh forsythia heralded the spring season and acted as a divider creating separate dining areas in the long room. Beyond the bar, at the far end of the room there were three large white trimmed windows on an exposed brick wall that overlooks the street. Creamy leather chairs with dark chocolate piping flanked tables dressed with pristine linens and accessorized with bottles of olive oil, dark wood pepper grinders, white votive candles, and lemons and tomatoes on the vine to create a still life setting at each of the tables. Double sconces and fairy lights in the beamed ceiling softly illuminated like a caress, and low music added to the overall appeal. 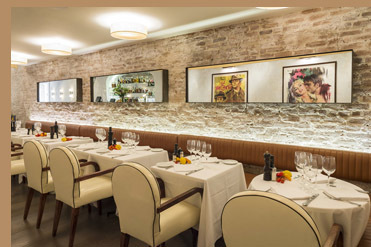 The inspired menu at MAMO restaurant has four signature culinary truffle creations like its sibling restaurant MAMO Le Michelangelo in Antibes, (Raviolini al tartufo, Risotto al Tartufo, Focaccia al Tartufo, and the MAMO burger with fresh truffles), as well as a truffle cocktail on their sophisticated cocktail menu of classic and contemporary drinks, the Martini al Tartufo. As truffle lovers, we opted to begin our dining experience by indulging in a pre-dinner cocktail of their ultra decadent, Martini al Tartufo made with Black Moth Truffle Flavored Vodka from Great Britain, dry vermouth, and Campari, with a generous orange peel twisted over and rubbed on the glass to elicit the essential oils, and then garnished with an abundance of shaved truffles. 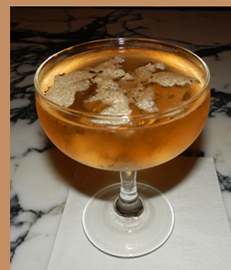 This well-balanced, amazingly delectable cocktail was served in an old-fashioned martini glass that added to the elegance and the ambience of this stylish restaurant. 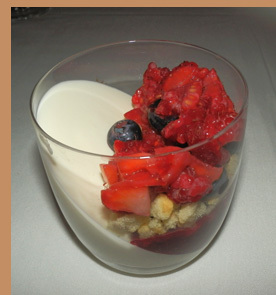 The menu consists of Antipasti (starters), Pizze (pizzas), Risotto (Arborio rice dishes) Insalate (salads), Pasta, Carne (meat), Pesce (fish), and Contorni (side dishes) so there is much to experience. For our antipasti, we had the Peperoni dolci grigliati con farcia al tonno (Grilled Red Peppers Stuffed with Tuna), and the Suppli di riso e insalata di finocchi (Rice croquettes and fennel salad). 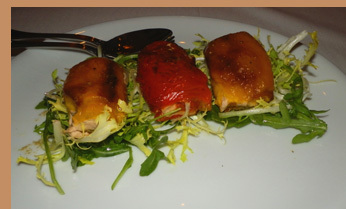 The peperoni (Chef Massimo Sola graciously shares this recipe in the Chefs' Recipes section), arrived as three colorful and very tasty peppers stuffed with tuna, capers, and anchovies. 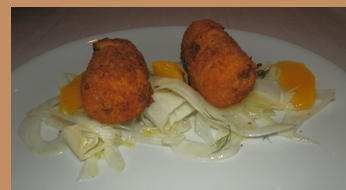 The Suppli di riso were 2 log-shaped seasoned crispy rice croquettes that presented a nice contrast to the accompanying shaved fennel and filleted orange salad. 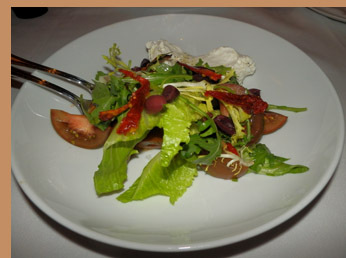 We continued by sharing the insalate Come a Capri made with black Kumato tomatoes from California, burrata imported from Italy, and baby romaine lettuce in a light Italian dressing. The burrata (an Italian cheese made with mozzarella and cream) was soft and lovely, and acted as the perfect accompaniment to the tomatoes and baby lettuce. For the pasta course, (Debra) continued with another truffle dish, the Raviolini al tartufo, which was tender housemade, tiny, postage-size cheese ravioli in a rich and creamy Comté cheese sauce embellished with a plethora of shaved truffles, which was definitely worth a trip to New York City to experience the raviolini. The restaurant has a nice selection of wines by the bottle and by the glass, and as Edward and I were parting ways on white wine versus red wine, MAMO's Captain, Jon Rugova, paired the ravolini with a glass of Greco di Tufo Tenuta Ponte, 13% alcohol, from Avellino, Italy, which was crisp, with nice minerality and citrus notes on the nose and on the palate, and was well matched with the creamy cheese sauce. 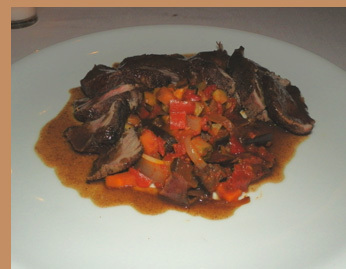 (Edward) continued with the Tagliata du filetto e salsa al vino rosso (Sliced beef filet in a red wine sauce with ratatouille from the carne (meat) section of the menu, which was very tender slices of beef in a delectable red wine sauce arranged around the colorful ratatouille. This course was paired with a glass of Bolgheri Doc Zizzolo le Fornacelle 2012, 13.5% alcohol from Toscana, Italy, a blend of Merlot and Cabernet Sauvignon which yielded a fruity bouquet on the nose with fruit on the palate and rounded tannins that brought out the flavors of the beef. A great beginning deserves a great ending, and the Dolci (desserts) of Panna cotta with fresh berries, and the Mousse al cioccolato (chocolate mousse accompanied by a poached prune and sesame cookie topped with whipped cream, were the perfect choices on which to end our wonderful dining experience at MAMO restaurant . Bravo MAMO restaurant on the amazing food, excellent service from the dedicated team, and a stylish and comfortable ambience in the heart of SOHO. What more could anyone want? 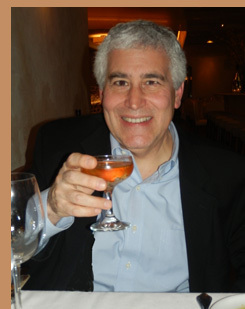 Congratulations on your upcoming 1-year anniversary on May 7, 2015. MAMO restaurant is open for dinner Monday through Thursday from 5:30 pm until 11:00 pm, Friday and Saturday from 5:30 pm until 11:30 pm, and Sunday from 5:30 pm until 11:00 pm. The restaurant is open for lunch Monday through Friday from 12:00 pm until 3:30 pm, and for brunch Saturday and Sunday from 11:30 am until 4:00 pm. 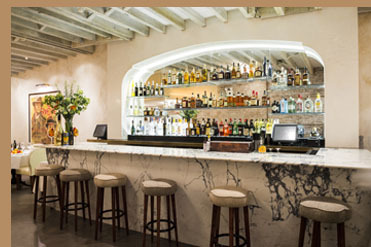 If you are traveling to the South of France, you might like to visit MAMO Le Michelangelo, a 25-year-old staple located on the French Riviera in Antibes. 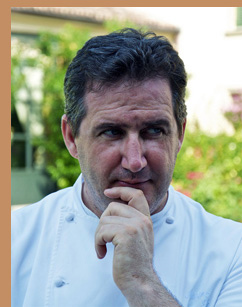 Read the Chefs' Recipes section for the interview with Chef Masssimo Sola and who graciously shares his recipes for: Peperoni dolci grigliati con farcia al tonno (Grilled Red Peppers Stuffed with Tuna), and Trancio Di Branzino, Pappa Al Pomodoro, Patate (Wild Sea Bass, Pappa Al Pomodoro, Fingerling Potatoes). © April 2016. Luxury Experience. www.LuxuryExperience.com. All rights reserved.